Osteoclasts are cells of hematopoietic origin with a unique property of dissolving bone; their inhibition is a principle for treatment of diseases of bone loss. Protocols for generation of human osteoclasts in vitro have been described, but they often result in cells of low activity, raising questions on cell phenotype and suitability of such assays for screening of bone resorption inhibitors. Here we describe an optimized protocol for the production of stable amounts of highly active human osteoclasts. Mononuclear cells were isolated from human peripheral blood by density centrifugation, seeded at 600,000 cells per 96-well and cultured for 17 days in α-MEM medium, supplemented with 10% of selected fetal calf serum, 1 μM dexamethasone and a mix of macrophage-colony stimulating factor (M-CSF, 25 ng/ml), receptor activator of NFκB ligand (RANKL, 50 ng/ml), and transforming growth factor-β1 (TGF-β1, 5 ng/ml). Thus, in addition to widely recognized osteoclast-generating factors M-CSF and RANKL, other medium supplements and lengthy culture times were necessary. This assay reliably detected inhibition of osteoclast formation (multinucleated cells positive for tartrate-resistant acid phosphatase) and activity (resorbed area and collagen fragments released from bone slices) in dose response curves with several classes of bone resorption inhibitors. Therefore, this assay can be applied for monitoring bone-resorbing activity of novel drugs and as an clinical test for determining the capacity of blood cells to generate bone-resorbing osteoclasts. Isolation of large quantities of active human osteoclast mRNA and protein is also made possible by this assay. Osteoclasts are highly differentiated cells of hematopoietic origin that resorb bone in the organism, and are the only cell type able to resorb bone from the bone slices in vitro. Other main characteristics of osteoclasts are: tartrate-resistant acid phosphatase (TRAP) staining (shared with macrophages), multinuclearity, formation of actin ring structure and a polar cell body during resorption, and contraction in response to calcitonin. Osteoclasts express a number of molecular markers, such as calcitonin receptor, RANK (receptor of RANKL, receptor activator of NFκB ligand), c-fms (receptor of M-CSF, macrophage-colony stimulating factor), cathepsin K, c-src, fosL1 and the vitronectin receptor (integrin αvβ3). Osteoporosis is a disease of low bone mass and increased fracture rate, commonly occurring in aged population and increasing in women after menopause. Drugs for osteoporosis treatment comprise several classes of compounds with anti-resorptive properties and a search for better drugs is ongoing. Therefore, an in vitro cell culture system for assaying the number and activity of osteoclasts would have an important role in discovering new osteoporosis drugs. Currently, no such system with isolated primary human osteoclasts has been described. Classically, osteoclasts have been generated in co-cultures of osteoblasts or stromal cells and hematopoietic cells from spleen or bone marrow. Since the breakthrough discovery of RANKL (also named OPGL, ODF) in 1998, which was identified as osteoblast-produced ligand promoting osteoclast differentiation; it has become possible to generate bone-resorbing osteoclasts without the need for co-culture . RANKL (together with M-CSF) could be added directly to the cultures of osteoclast precursors to generate mature, active osteoclasts. This provided important advantages over previous co-culture systems, as it enabled the work with the cells from one lineage and, at the end of the culture, with pure osteoclasts. Early reports on RANKL-dependent culture systems described the conditions for generation of human osteoclasts from the peripheral blood mononuclear cells (PBMNC) [2, 3]. These protocols were similar in the use of RANKL, M-CSF and dexamethasone or hydrocortisone, but differed in the use of PBMNC fraction (adherent plus non-adherent or only adherent cells), the length of the assay (7–12 days vs. 14–21 days), concentration of M-CSF, seeding cell density and the source of RANKL cytokine. TGF-β1 was not included in the culture medium in both of these methods. While these reports were an important scientific advance by showing that it is possible to generate human osteoclasts from PBMNC, the described conditions were not robust enough to ensure production of highly active cells in a relatively stable fashion. Similar results were obtained when a method for osteoclast formation from human bone marrow cells  was adapted to PBMNC and when M-CSF and RANKL were used instead of the co-culture with osteoblasts. The application of these protocols in our laboratory produced TRAP-positive cells, but their formation was not RANKL-dependent and the bone resorption activity of the cells was poor (only few percent of bone slice area resorbed). With the aim to set up a reproducible system that is amenable to screening and pharmacological characterization of drugs with bone resorbing properties, we have optimized the conditions for human osteoclast generation. Three different, simple read-outs were used to measure osteoclast numbers and activity. This system has been used over extended periods of time, enabling pharmacological characterization of several classes of known bone resoprtion inhibitors, for the first time with human primary osteoclasts. There are several possible applications of this assay: a) as a low to medium throughput screening system for anti-resorptive agents, b) as a source of human osteoclast RNA and protein, and c) as a clinical assay, whose a diagnostic value could be estimated by testing various patient populations. Either whole blood (about 50 ml) or the "buffy coat" cell preparation from about 450 ml of whole blood from male volunteers (up to 40 years of age) was provided by the Transfusion Center, Basel. These cells were once more purified over the Ficoll-Paque: 15 ml of whole blood or "buffy coat" was mixed with 15 ml of warm (37°C) phosphate-buffered saline (PBS, without Ca2+ and Mg2+), layered over 15 ml of Ficoll-Paque (Amersham Pharmacia Biotech, Uppsala, Sweden) and centrifuged (1500 g, 30 min, room temperature, without the brake). The cell layer on top of the Ficoll-Paque was collected, resuspended in 10 ml of warm PBS (without Ca2+ and Mg2+), diluted with 40 ml PBS and centrifuged (1500 g, 15 min, room temperature, with the use of brake). Subsequently, cells were counted in a hematocytometer, and used immediately, or aliquoted, frozen and stored in liquid nitrogen. Whole population of PBMNC (fresh or thawed) was plated in 96-well plates at 6 × 105 cells per well in 0.2 ml of medium (α-MEM, Gibco, pH 7.4, containing 10% FCS from Amimed, batch #S03485). Medium was also supplemented with the following cytokines, growth factors and hormones: 25 ng/ml human M-CSF (R&D Systems, Abingdon, UK), 50 ng/ml human RANKL (Insight Biotechnology, Wembley, UK), 5 ng/ml human TGF-β1 (R&D Systems, Abingdon, UK), and 1 μM dexamethasone (Sigma, Buchs, Switzerland). The cells were re-fed twice weekly by demi-depletion (half of the medium withdrawn and replaced with the fresh medium). The culture duration was 17 days for both TRAP staining and pit assays. For pit assays the cells were plated from the beginning of the culture on top of sterile bovine cortical bone or ivory dentin slices placed in 96-well plates. The culture conditions were as described above. A) Purification of osteoclast precursors from PBMNC with CD14 and CD34 antibodies was reported [5, 6]. This is not necessary in our method, making the protocol simpler and cheaper. B) Serum was batch-selected. C) RANKL from Insight Biotechnology was more active than RANKL from PeproTech EC Ltd. (London, UK). D) Osteoclast formation phase lasted until day 8–10 (cell morphology, expression of molecular markers and the start of bone resorption). The rest of the culture period is necessary for osteoclast maturation and full activation. TRAP staining of adherent cultures was done with a kit from Sigma (Buchs, Switzerland) exactly according to manufacturer's instruction (Procedure No. 386). The stained cells developed red color of different intensity. For measurement of resorbed area in the pit assay, the bovine cortical bone or dentin slices were washed with PBS, incubated in 5% sodium hypochlorite for 10 min, washed twice with water, and stained with 0.1% toluidine blue. The pits developed blue to purple color. The number of TRAP-positive multinucleated cells and the area of resorbed bone in the pit assay were determined using the 1 × 1-mm grid placed in the ocular of the microscope. For TRAP assay, Zeiss Axiovert 100 microscope (Zeiss, Oberkochen, Germany) was used; and for pit assay Leitz Laborlux S microscope (Leica AG, Glattbrugg, Switzerland) was used. In the TRAP assay, the number of TRAP-positive multinucleated cells (>2 nuclei per cell) was measured at predetermined sites of the area of 1 × 1 mm. Five sites were measured in a well of a 96-well plate, and a mean value was calculated. Four wells were measured in total per one condition and these results were expressed as mean ± SEM. Typical values for the number of TRAP-positive multinucleated cells in controls were about 400–600 cells per well (96-well plate). In the bone resorption pit assay, four bovine cortical slices were assessed per one condition, each in one well on 96-well plate. Quantification was done on the whole bone slice area (3 × 3 mm on 96-well plates). The results were expressed as mean ± SEM. Typical values for resorbed areas in controls were between 25 and 50%. In some experiments, ivory dentin slices were used. All slices were prepared by cutting blocks of bone or dentin at 0.3 mm thickness with a low speed saw using water cooling (Isomet, Buehler, Lake Bluff, Illinois, USA). A) Cell number was optimized in titration experiments using 1, 3, 6, and 10 × 105 PBMNC per well of a 96-well plate. 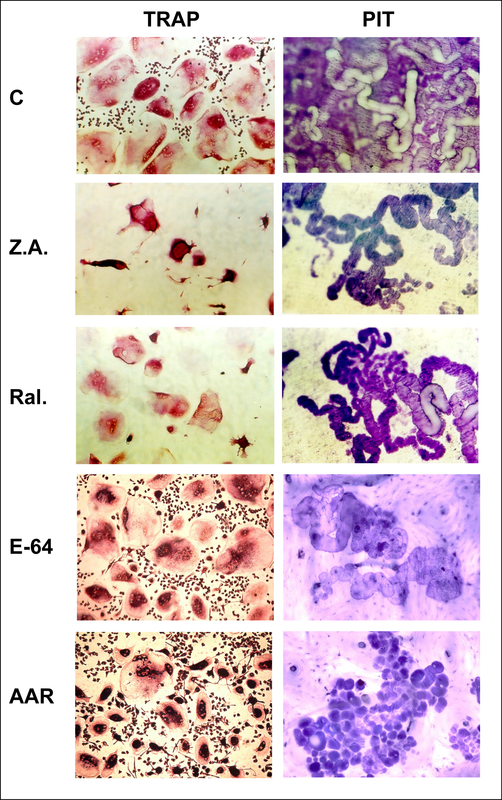 B) TRAP-stained area per well (represents both mononuclear and multinuclear cells) was also measured, but it did not correlate with the bone resorption activity of osteoclasts. Thus, we do not recommend total TRAP measurements, either as areas or as enzyme activity in cell lysates, as read-outs for osteoclast formation. C) Pits produced on dentin slices were easier to measure than pits on cortical bone slices (a more regular shape, absence of stained structures on dentin, and low background staining). Osteoclasts released higher amounts of collagen fragments in dentin. However, bovine cortical slices were routinely used for screening procedures because of easier accessibility and lower costs. D) For drug screening purposes, the osteoclast resorption activity should be >10% of resorbed area. E) Higher resorption was obtained with culture duration of 17 days, than of 10 and 14 days. For CrossLaps assay with human osteoclasts, the conditioned culture medium was collected three days after medium change at the end of the culture (day 17). Collagen fragments (CTx) were quantified using the serum CrossLaps™ one step ELISA kit (Osteometer, Herlev, Denmark). Aliquots of 50 μl were assayed directly or diluted 1:5 with the assay buffer, according to the instructions of the manufacturer. Samples of culture medium from wells containing bone slices without cells were also measured. If such values exceeded 100 pM, they were subtracted from values obtained for samples with cells. The occasional minus values in the assay were adjusted to zero. Typical values for control collagen fragment concentration after 17 days were 10–35 nM, depending on the osteoclast activity and the choice of slice material (bone or dentin). Microphotography was done with Leica Fluovert FS microscope, Leica DC300 digital camera (Wetzlar, Germany) and Leica IM 50 software (Leica Imaging Systems, Cambridge, England). We recommend taking microphotographs of both cells and pits, at least at the method set-up stage. They provide valuable information on the quality of the assay. Zoledronic acid, raloxifene and AAR494 were synthesized in the Novartis Chemistry laboratories. E-64 was purchased from Sigma (Buchs, Switzerland). Zoledronic acid was dissolved in sterile water, while the other three compounds were dissolved in dimethyl sulfoxide (DMSO). All compound stock solutions were 10 mM and were stored as aliquots at -20°C. For dose response curves, compound stock solutions were serially diluted in the culture medium. The IC50 values were calculated from dose response curves in each experiment using the curve fitting with the software Origin 7 (OriginLab Corporation, Northampton, USA). Cells have been harvested in a guanidinium isothiocyanate containing buffer and total RNA was extracted, treated with DNAse I and purified according to the manufacturer's instructions (RNeasy mini kit, QIAGEN, Switzerland). The yields of RNA were 2–3 μg/well of a 6-well plate or about 200 μg per one buffy coat (about 450 ml blood). The yields of protein were 1 mg/10 cm plate or about 10 mg per one buffy coat. First strand complementary DNA was synthesized according to standard protocols. Polymerase chain reaction (PCR): One μl of diluted cDNA or RT(-) controls was used. PCR was performed in a final volume of 25 μl, containing 100 μM of each dNTP, 1 μCi of α[32P]-dATP, 1 μM of each primer and 1.25 units of "hot start" thermostable DNA polymerase and the corresponding reaction buffer (FastStart Taq, ROCHE Molecular Diagnostics, Switzerland). The amplification protocol consisted of an initial step of 5 min at 95°C, then desired number of cycles of denaturation at 94°C for 1 min, annealing at 57°C (with some exceptions) for 1 min, and extension at 72°C for 2 min. The final cycle included incubation at 72°C for 10 min. Aliquots of PCR products, supplemented with a loading buffer (final concentrations: 5% glycerol, 10 mM EDTA, 0.01% SDS, 0.025% xylene cyanol and bromophenol blue dyes), were fractionated on 8% polyacrylamide gels. The gels were vacuum-dried and exposed to phosphor-storage screens (Molecular Dynamics, USA). Gel pictures and quantification of signals have been obtained after scanning with PhosphorImager SF and ImageQuant software analysis (Molecular Dynamics, USA). Each primer set was first pre-tested in cycle curve experiments to determine the linear range and the optimal cycle number. Reverse: 5'-GACAGGTCCATCAAGTAGTAG-3'; product size 202 bp, annealing at 60°C, 30 cycles. With an aim to develop a human osteoclast assay suitable for drug screening, we have optimized the existing protocols for osteoclast generation from blood cells. PBMNC were used directly after centrifugation with Ficoll, without any further enrichment. Initially, we tried to optimize osteoclast generation using the existing protocols [2, 3]. However, even dexamethasone alone, without M-CSF and RANKL, could induce formation of TRAP-positive cells (for example, TRAP-positive cell area was 1.2 ± 0.1% with medium plus FCS, 27.4 ± 3.9% with medium, FCS and dexamethasone, and 24.3 ± 1.4% with medium, FCS, dexamethasone, M-CSF and RANKL; values are means ± SEM). The activity of generated cells was either completely missing or was rather low, indicating that the number of mature, active osteoclasts was low and that generated cells are most likely macrophage polykaryons. Subsequently, we tested the addition of TGF-β1 to the cultures, although controversial reports existed on its effects on human osteoclast formation [7, 8]. In the presence of 10 % FCS, M-CSF, RANKL and dexamethasone, TGF-β1 had a dramatic stimulating effect on the bone-resorbing activity of generated human osteoclasts, enhancing their activity by 8-fold (Fig. 1 upper and middle panels). The osteoclasts generated in the presence of TGF-β1 were also more multinucleated. They expressed a full set of eight osteoclast markers from day 8–17, confirming the cell phenotype at the molecular level (Fig. 1, lower panel, OSM+ samples). However, the cells without the medium supplements also expressed all markers from day 13–17, were partly TRAP-positive, but were not active in the pit assay (Fig. 1, lower panel, OSM- samples, and data not shown). Thus, the pit assay is necessary for the confirmation of mature osteoclast phenotype. In all subsequent experiments, we used the above culture conditions to generate osteoclasts. Generation of highly active human osteoclasts from peripheral blood mononuclear cells: a requirement for TGF-β1. Human osteoclasts were generated from peripheral blood mononuclear cells (PBMNC) as described under Materials and Methods. The medium contained either a mix of 10% FCS, dexamethasone (1 μM), M-CSF (25 ng/ml) and RANKL (50 ng/ml) (- TGF-β1) or this mix with 5 ng/ml TGF-β1 (+ TGF-β1). Number of TRAP-positive multinucleated cells and area of resorbed bovine bone or dentin was quantified microscopically. Upper panel: Quantification of TRAP-positive multinucleated cell number and pit area. The results are shown as means ± SEM; n is a number of independent experiments. Middle panel: Microphotographs of TRAP-stained cells on plastic and of toluidine blue-stained pits on dentin. Bottom panel: Molecular characterization of cells during osteoclast differentiation from PBMNC. Total RNA was extracted at the indicated times and expression of 8 osteoclast markers and 18S rRNA was measured by radioactive quantitative RT-PCR. RT-: reverse transcription omitted. OSM: osteoclast stimulating medium, containing the above mix of serum, dexamethasone, M-CSF, RANKL, and TGF-β1. No OSM cultures contained medium and FCS only. B: bone slices; D: dentin slices. Nd: not determined. To run drug screening assays, it would be advantageous to have a large, stable pool of PBMNC to work with. Therefore, we examined the effect of cell freezing and pooling on the osteoclast generation and activity (Fig. 2). Fifteen frozen-thawed PBMNC batches from different donors exhibited variable potential in forming TRAP-positive multinuclear cells (Fig. 2, upper panel) and even larger variation in their ability to resorb bone (Fig. 2, middle panel). Importantly, these two parameters did not change in parallel. Six batches of freshly isolated PBMNC were analyzed and among them the variation was smaller. Freezing-thawing did not have a big effect on osteoclast formation or activity (Fig. 2, bottom panel). Thus, for large analyses we collected PBMNC from several donors, froze them, and tested them individually for osteoclast formation and activity. Then, we pooled only those PBMNC batches that showed good activity (>30% area of bone slice resorbed). This enabled us to test different compounds on the homogenously active cell population. Individual variation in osteoclast generation and activity from different donors, and the effects of cell freezing-thawing. Human osteoclasts were generated from peripheral blood mononuclear cells (PBMNC) as described under Materials and Methods. 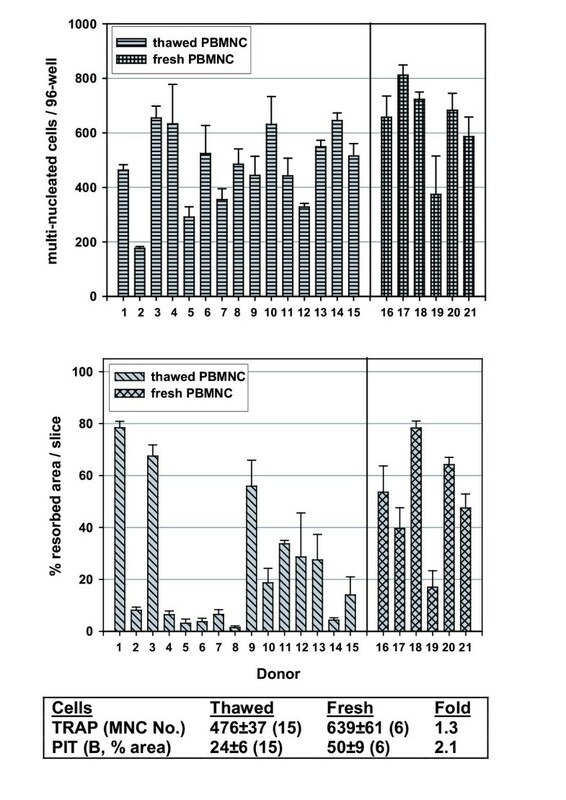 The results from 21 donors are presented as quantification of TRAP-positive multinucleated cell number (upper panel), and as resorbed area in the pit assay (middle panel). The results are summarized in the bottom panel. The results are shown as means ± SEM; n is a number of independent experiments. PBMNC were used either after freezing-thawing or as freshly isolated cells. B: bone slices. For some compounds, such as cathepsin K inhibitors, resorbed area may not be a sensitive read-out, as the pit depth and volume are affected more than the pit area . Therefore, in addition to measuring TRAP-positive multinucleated cell number and area of resorbed bone, we established a third read-out, reflecting the pit volume and a degree of collagen degradation in the bone slice. We used human-specific CrossLaps ELISA assay for measuring CTx collagen fragments. This assay was effective with both ivory dentin and bovine bone (Fig. 3). The highest signal was obtained in the conditioned medium collected at the end of culture period (day 14–17). The bisphosphonate zoledronic acid inhibited collagen fragment release in all conditions examined (Fig. 3). Establishment of a collagen fragment release read-out with dentin and bone slices. Collagen fragments released from the pits on dentin or bone slices were measured in the cell culture medium with CrossLaps ELISA kit. The medium was collected after 3 days of cell culture at the indicated times (for example, day 10 contains medium from days 7–10). The cultures were treated from the start with the vehicle PBS or with 50 nM zoledronic acid. The numbers over the bars for treated samples are % inhibition relative to the corresponding control. 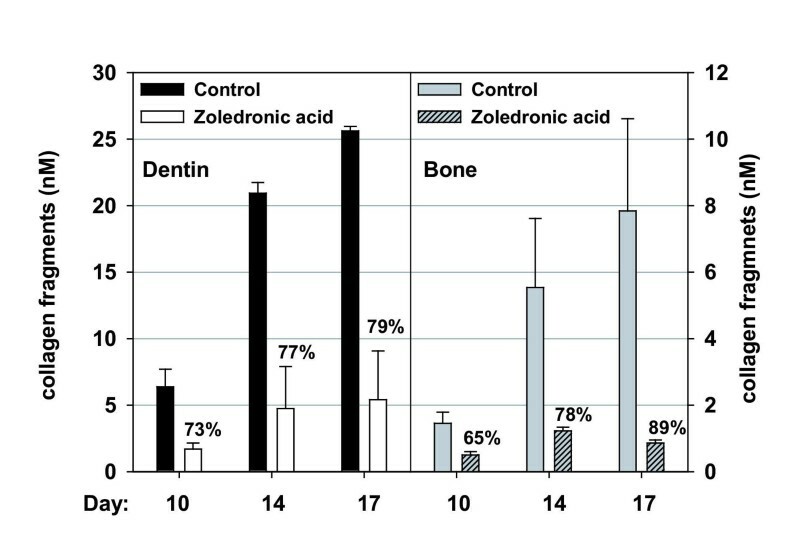 The effects of several known bone resorption inhibitors were measured in the human osteoclast assay. We used representative compounds for bisphosphonates (zoledronic acid), selective estrogen receptor modulators (SERM, raloxifene) and cathepsin K inhibitors (E-64 and AAR494). These compounds have different mechanisms of action and it was interesting to evaluate whether the assay would detect these differences. The control osteoclast cultures at day 17 contained only TRAP-positive cells and were almost confluent (Fig. 4, TRAP). Osteoclasts were of various sizes: very large cells, smaller multinucleated cells, and small mononucleated cells (Fig. 4, TRAP, C). In the control cultures on bone slices, pits covered most of the bone slice surface and formed characteristic resorption tracks, resulting from osteoclast migration (Fig. 4, PIT, C). The bisphosphonate zoledronic acid (50 nM) and selective estrogen receptor modulator (SERM) raloxifene (100 nM) reduced osteoclast number, leaving the culture largely depleted from mononuclear and smaller multinuclear cells (Fig. 4, TRAP, Z.A., Ral.). At these concentrations both compounds partially inhibited pit formation (Fig. 4, PIT, Z.A., Ral.). Two cathepsin K inhibitors were tested, a non-selective cysteine protease inhibitor E-64 and a selective inhibitor AAR494. Both compounds did not affect osteoclast formation, but partially inhibited pit formation (Fig. 4, E-64, AAR). AAR494 in particular induced changes in cell morphology, evident as densely TRAP-stained regions within cells. In addition, the remaining pits after treatment with this compound did not have a track appearance, but were cluster-like, containing small round pits. The effects of several bone resorption inhibitors on human osteoclast and resorption pit morphology. Human osteoclasts were generated as described under Materials and Methods, with or without the presence of bone resorption inhibitors: zoledronic acid (Z.A., 50 nM), selective estrogen receptor modulator (SERM) raloxifene (Ral., 100 nM), non-specific cathepsin K inhibitor E-64 (100 nM), and selective cathepsin K inhibitor AAR494 (AAR, 100 nM). Microphotographs show TRAP-stained cell morphology at culture day 17 (left panels) and pit morphology on dentin (control, zoledronic acid and raloxifene) or bovine bone (E-64 and AAR494). C, control. The activities (IC50 values) of E-64 and AAR494 on cathepsin K, S and L were (E-64: 1.4; 4.1; 2.5 nM, and AAR494: 3.4; 3700; >10000 nM, respectively). The same bone resorption inhibitors were analyzed for their efficacy and potency in dose-response curves for three assay read-outs: osteoclast formation (multinucleated cells), osteoclast activity as resorbed area and as collagen fragments (Fig. 5). All three parameters changed in parallel upon treatment with zoledronic acid and raloxifene; however, raloxifene exerted only a partial effect, while zoledronic acid was fully effective. By contrast, cathepsin K inhibitors produced dose response curves that diverged. Multinucleated cell number curve stayed unaffected at all concentrations. The resorbed area dose response curve showed a decline, but maximal effects were still partial. As expected, dose response curve for collagen fragments was most sensitive towards cathepsin K inhibitors. The non-selective inhibitor E-64 was more potent in suppressing collagen fragment release than the selective cathepsin K inhibitor AAR494. 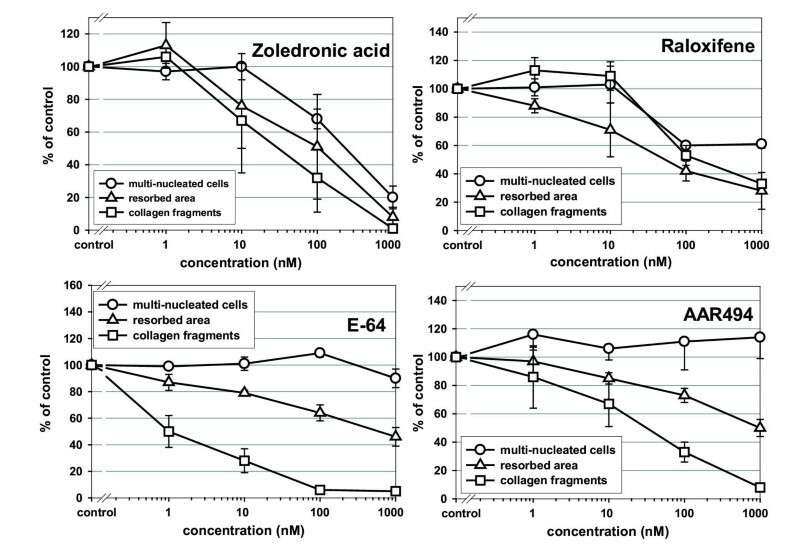 Dose response curves for zoledronic acid, raloxifene, E-64 and AAR494 in the human osteoclast assay: measurements of osteoclast formation, pit area and collagen fragment release. Human osteoclasts were generated as described under Materials and Methods in the presence of increasing concentrations of compounds, as indicated. At the end of the 17 day-culture three quantitative read-outs were measured: the number of TRAP-positive multinucleated cells on the plastic, the resorbed area on bone slices, and the concentration of collagen fragments in the medium. The graphs were generated with Sigma Plot, and concentrations inducing 50% inhibition (IC50 values) were calculated after curve fitting by the software Origin 7. The following IC50 values are means ± SEM from 3 independent dose response curves, in which each measurement was done in quadruplicates. The IC50 values are shown in the order: cell number, resorbed area, and collagen fragments: zoledronic acid (102 ± 4; 173 ± 127, 182 ± 150 nM), raloxifene (17 ± 3; 29 ± 13; 46 ± 13 nM), E-64 (>1000; 17 ± 2; 4 ± 3 nM), and AAR494 (>1000; 127 ± 105; 56 ± 27 nM). These data together indicated that this assay is suitable for low to medium throughput screening of bone resorption inhibitors. We confirmed this during more than two years of experience with this assay. We have optimized culture conditions for generation of human osteoclasts from human PBMNC to produce up to 2,200 cells/cm2 that were active by resorbing up to 80% area of the bone slice. Main distinguishing features of our protocol are: a) use of non-purified PBMNC, b) presence of a combination of TGF-β1 and dexamethasone from the start of the culture, in addition to well known osteoclastogenic factors M-CSF and RANKL, c) use of only commercial and not self-made reagents, enabling reproducibility, d) the length of cultures (>14 days), and e) pre-testing of cells from various donors to avoid individual variation. A number of cytokines has been described to stimulate human osteoclast generation and /or activity, such as prostaglandin E2, interleukin-1α, tumor necrosis factor-α . TGF-β, however, was reported to either inhibit or stimulate human osteoclast formation [7, 8]. Our data show that TGF-β1, but not TGF-β3 (data not shown), in presence of dexamethasone, M-CSF and RANKL, has a major positive impact on osteoclast activity and a smaller effect on the osteoclast formation. During the course of our work others have also reported stimulatory effects of TGF-β1, but in the absence of dexamethasone . The removal of non-adherent PBMNC was shown to increase human osteoclast formation to the level induced by TGF-β . The removal of non-adherent cells would have been a cheaper and simpler protocol for production of human osteoclasts than the addition of TGF-β1. However, we did not detect any positive impact of the removal of non-adherent cells (data not shown), suggesting that the effect of TGF-β1 is not due to the presence of lymphocytes in blood cell cultures, as proposed. Thus, we continued to use TGF-β1. In agreement with a small positive effect on osteoclast formation, TGF-β1 did not enhance osteoclast markers (data not shown). The mechanism used by TGF-β1 to stimulate osteoclast activity remains to be determined. The described assay is the first human primary osteoclast assay that has been adapted for drug screening. Previous osteoclast assays for measurement of compound activity were either done with non-human cells (mouse, rat, rabbit) [12–14], or, if they used human cells, were done with a human monocytic cell line in co-cultures with osteoblastic cells , or used human bone marrow-derived osteoclasts , or human tumor osteoclastoma-derived cells . Although useful, these methods do not use active primary human osteoclasts. Furthermore, obtaining tissues required for osteoclast precursor isolation in these methods is more difficult than obtaining human blood. To test reproducibility and predictability of human osteoclast assay, the IC50 values were determined for three known classes of bone resorption inhibitors, some of which have already been tested in clinical studies: bisphosphonates, SERM, and cathepsin K inhibitors. A Src kinase inhibitor was also tested and was active, but it was not characterized in detail (data not shown). Zoledronic acid is the most potent bisphosphonate known . In primary human osteoclast assay, all three read-outs decreased in parallel, indicating that main effect of zoledronic acid was on osteoclast number, in agreement with the notion that N-containing bisphosphonates induce osteoclast apoptosis . Estradiol and the SERM raloxifene are known inhibitors of bone resorption in vivo, which were recently demonstrated to exert direct effects on mouse osteoclasts . Such effects have not been shown so far with human osteoclasts. Both compounds were active in human osteoclasts (estradiol data not shown), but, in contrast to bisphosphonates, the maximal inhibition by raloxifene and estrogen remained partial. Interestingly, this in vitro result correlates well with a better efficacy of bisphosphonates as compared to estrogen and SERM in the retrospective analyses of clinical studies . Although other factors, such as pharmacokinetics and adverse effects, influenced the outcome of clinical studies, our in vitro data show that even at the level of osteoclasts, there is a limited potential of SERM to inhibit bone resoprtion. 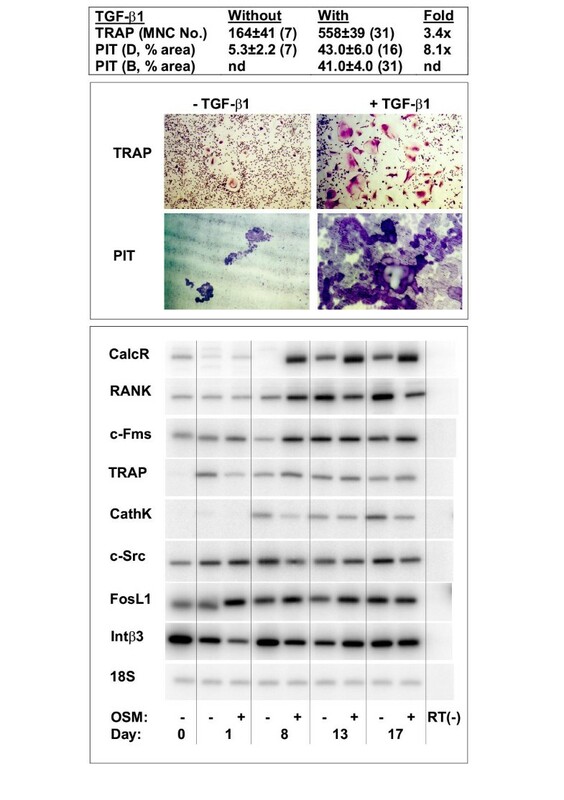 A non-specific and a specific cathepsin K inhibitor were tested in the human osteoclast assay. Both compounds did not affect osteoclast number, in agreement with the notion that their target is a protease involved in bone resorption, but not in osteoclast formation. Human osteoclast activity was dose-dependently inhibited, with collagen release showing stronger inhibition, again in agreement with the mechanism of action of these inhibitors. E-64 was more potent, but not more effective than AAR494, suggesting that other cathepsins play a minor role in bone resorption. Our results with E-64 differ from those generated in rat osteoclasts, where resorption area was almost unaffected by the compound . This apparent discrepancy may represent a difference in species or in experimental conditions, as our human assay is much longer than the rat assay. We detected a peculiar, cluster-like morphology of pits remaining after treatment with AAR494, suggesting that the compound caused osteoclasts to interrupt the process of resorption. This phenomenon appears to be due to inhibition of osteoclast motility and deserves further examination. An additional application of the human osteoclast assay could be in the clinic. Already limited analyses of about 20 samples from a rather homogenous population of male blood donor volunteers younger than 40 years showed a considerable variation in the ability of PBMNC to form active osteoclasts. As small amounts of blood (<10 ml) suffice for generation of osteoclasts, patients could be screened for the ability of their circulating osteoclast precursors to generate osteoclasts. Osteoporotic, normal and other patient categories could be examined and a correlation between activity of osteoclast precursors and disease occurrence and progression could be evaluated. We conclude that modified conditions for in vitro generation of human osteoclasts from peripheral blood result in a stable generation of active osteoclasts. As documented by testing several classes of bone-resorption inhibitors, this assay can be used for screening novel drugs. As this assay can be easily performed with a small volume of human blood, it can also be used to monitor the capacity of blood cells to generate bone-resorbing osteoclasts. We thank Roger Vuille for his technical assistance with the CrossLaps ELISA, Martin Missbach and Rene Lattmann for the synthesis of AAR494 and information on its selectivity, and Yves Seltenmeyer for the help in preparation of bone and dentin slices. Kind advice on bone marrow osteoclast generation and bone resorption assays by Usha Sarma, John Scopes, Helen Massey and Cheryl Lader (Flanagan laboratory, St. Mary's Hospital, London, UK) during the visit of MS in 1999 is gratefully acknowledged. The authors are employed by the Novartis Institutes for BioMedical Research. N-H. L-N. performed all experimental studies, except measurements of collagen fragments, and prepared the Figures. RG supervised collagen fragment assays. DC designed the primers for osteoclast markers and tested most of them by radioactive quantitative RT-PCR. NZ supervised N-H. L-N. in radioactive quantitative PCR. MS conceived the study, supervised the experimental work and wrote the manuscript. All authors read and approved the final manuscript.